Joie Gharrity Founder of 113 Branding Digital Media Studio is a Brand Director, Live Stream Host, Author, and International Speaker. She worked in the Hollywood entertainment industry for 15+ years at top companies, in film, television, original web content, and branded entertainment. She was hand-picked by the ABC Studio President to launch the first multi-media startup business for The Walt Disney Company. In her book The Red Carpet Guide to Visibility and Influence, Joie shares branding strategies, techniques, tools, and tips that can be implemented easily. She is passionate about being of service and working with entrepreneurs to help them gain Superstar Visibility and Influence in the marketplace. In her book The Red Carpet Guide to Visibility andInfluence, Joie shares branding strategies, techniques, tools, and tips that can be implemented easily. She recently was invited to sit on the DDI Branding/Reels & Links Panel as the brand expert at the prestigious Director’s Guild of America in Los Angeles, CA. Shortly after the event, she launched the 113 Branding Hollywood Director Division. Gharrity launched The Hollywood Spotlight Series, a LIVE interview show that features industry influencers. Guests share tools and tips on how they took their dreams from conception to fruition. The intention of the show is to inspire everyone to Dream Big and take inspired action. She also launched The Red Carpet DTV, another LIVE interview show that features entrepreneur leaders in their field. Entrepreneurs share strategies and tips with the marketplace on how to take their business to the next level. Both shows double as organic commercials. Joie spotlights guests’ books, products, services, movies, web series and more. Both shows get thousands of views. Joie truly believes that it is your birthright to stand in your spotlight and shine bright and that it has nothing to do with the last name you were born into or your vocation. Instead, it has to do with living your true purpose, turning up your Visibility spotlight and allowing your Influence to shine. 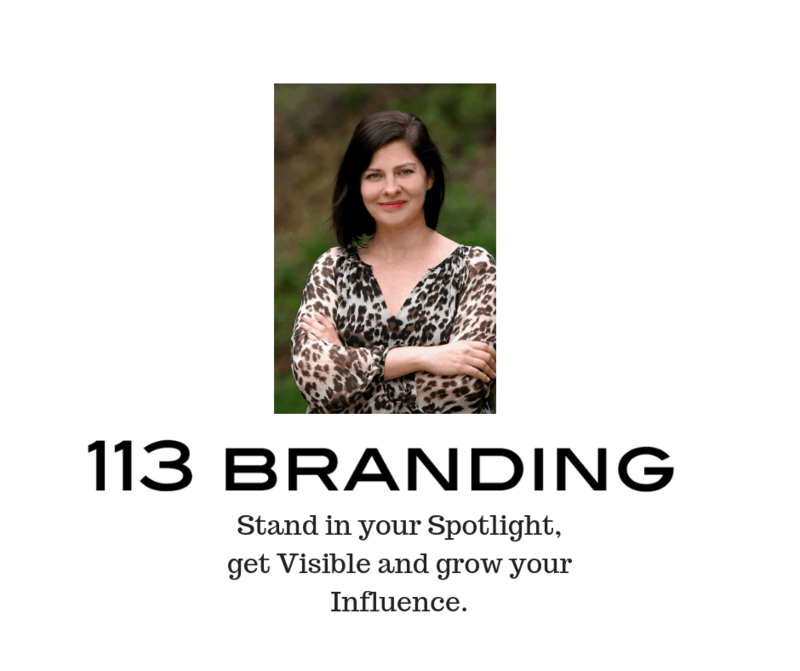 Joie was inspired to launch 113 Branding because she realized that most entrepreneurs were not focused on standing in their own Spotlight and selling themselves, which impacts their long-term success. She integrates her strategic branding and content development vision with both the creative and business sides of the entertainment industry. In her book The Red Carpet Guide to Visibility and Influence, Joie shares branding strategies, techniques, tools, and tips that can be implemented easily. She recently was invited to sit on the DDI Branding/Reels & Links Panel as the brand expert at the prestigious Director’s Guild of America in Los Angeles, CA. 2. What is The Double Dip? The Triple Dip? 3. You talk about “spotlights” and how spotlighting other brands shines the spotlight back on your brand. What do you mean? 4. A majority of your brand strategies are community driven. How do they make an impact in business for women entrepreneurs? 5. You talk about incorporating collaborations into your business plan is essential in order to build a thriving brand? What do you mean by that? 6. What is the difference between being “of” service and “in” service? 7. What is a pop-up billboard? 8. You share “Your company brands Visibility and Influence in the marketplace is directly linked to your brands earning power.” Please expand on that. 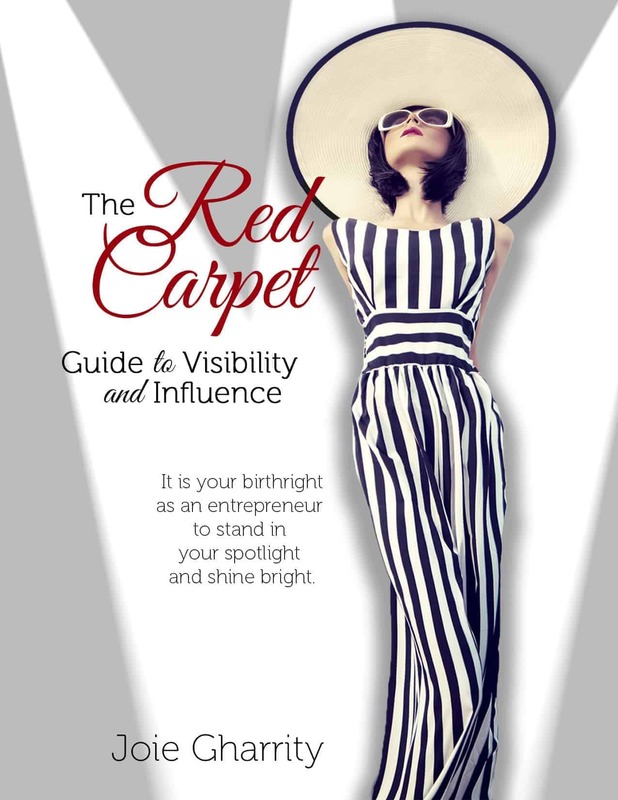 In The Red Carpet Guide to Visibility and Influence, Joie shares tangible Visibility and Influence strategies, techniques, and tips. She designed this book to double as a guide so that entrepreneurs can implement the branding and marketing techniques easily and quickly and create a business that soars high in the marketplace. How can you treat your business like it belongs in Hollywood? Joie Gharrity from 113 Branding knows the importance of merging Hollywood insider knowledge with your branding. She has a unique point of view, that really just makes damn good sense. Joie believes in embracing your past and not hiding from all of your achievements. Her incredible method of developing your song, that inspires and uplifts those around you, will give you a solid messaging advantage. Online marketing is a great way to increase your brand Visibility and Influence and that translates into increased sales. Joie shares 3 simple online marketing strategies that you can implement immediately and get your brand noticed in a big way. Listen to the episode featuring Brand Strategist, Marketer, Author and Speaker Joie Gharrity. Brand Strategist Joie explains how she works with people and their brand. Coco Channel and Marilyn Monroe were great influencers for her. Your brand is your song, says Joie. What is your Song? The Double Dip is when two company brands cross-pollinate “content” and share it across their social media channels to leverage each other net worth. Collaboration causes a ripple effect amongst all who play. Joie’s online net worth is 3.1 Million. Visibility and Influence expert Joie Gharrity is an International Keynote Speaker known as the speaker who Motivates and Entertains. She shares signature Hollywood stories with the audience about what she learned while working alongside Hollywood stars and on blockbuster movies. Each keynote is tailored to provide the audience with tangible tools that gains them Visibility and Influence and elevates them and their company brand to superstar status in the marketplace. Create valuable content that converts your “Ideal Client” to brand evangelist. How to shine a bright Spotlight on your past, current and upcoming projects and turn up the buzz in the marketplace. Turn the online world into your private red carpet marketing machine to increase your influence and earning power.